Forget hiring, many of the companies are actually firing away their employees, and some ‘virtualizing’ them ala Mahindra Satyam. This picture, got on a mail forward, very aptly describes the current market scenario. 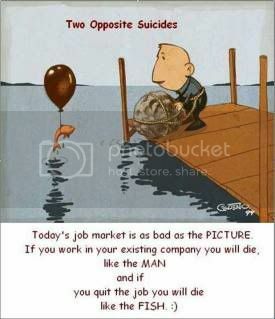 One can’t be like the man jumping off, due to the huge liabilities attached and a very remote chance of a job.